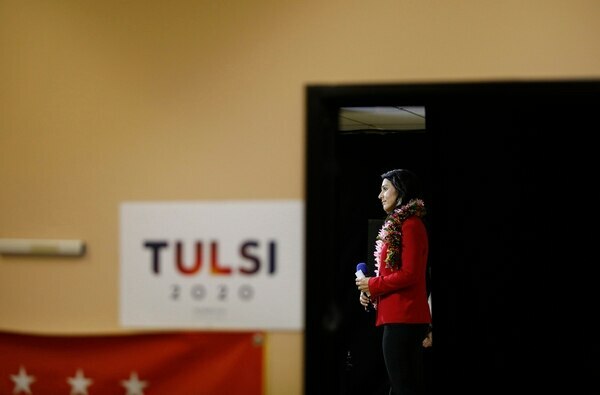 LAS VEGAS — Democratic presidential candidate Tulsi Gabbard says her top priorities if she’s elected to the White House in 2020 would be to end military action in countries such as Iraq and Syria and to de-escalate tensions with nuclear-armed countries like Russia and China. A congressional Democrat just back from a weeklong trip to Syria defended her meeting with the war-torn country's president, saying Wednesday there's no possibility of a viable peace agreement unless Bashar Assad is part of the conversation. The 37-year-old's event at the Asian Cultural Center downtown came as she made her first trip as a presidential candidate to the early-nominating state of Nevada. She planned to hold a "meet and greet luau" west of the Las Vegas Strip later in the evening. Gabbard has struggled to match the name recognition and fundraising of others in the crowded Democratic field such as Vermont Sen. Bernie Sanders and former Texas Rep. Beto O’Rourke. The congresswoman said she's working to spread her message with grassroots support. Before her town hall started, volunteers handed out fliers to attendees asking them to donate to her campaign and informing them that she needs to receive donations from 65,000 people in order to qualify for a spot in Democratic National Committee debates this summer. Gabbard, wearing a lei around her neck Monday afternoon, preached a peaceful, at-times spiritual message, describing a "corruption of sprit casting a shadow over our country" and a need for people to recognize the suffering of others and to come together to make a change. 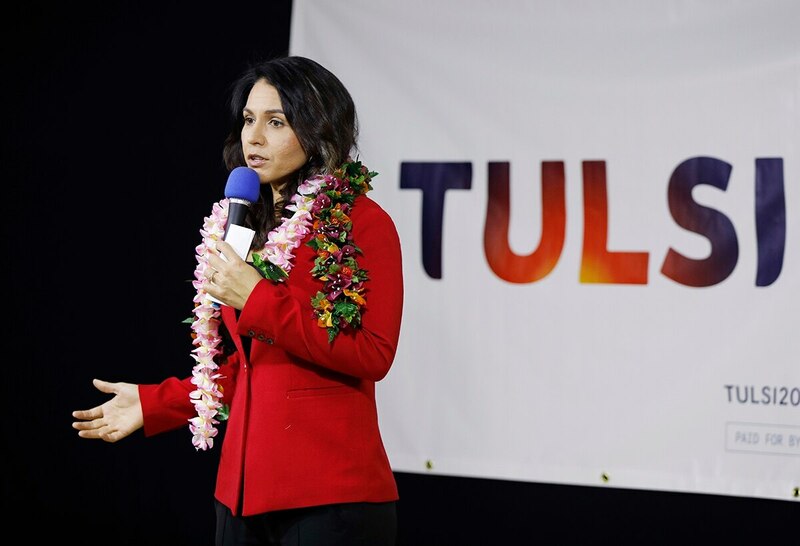 Unlike other Democratic candidates, Gabbard didn’t use her speech to criticize President Donald Trump, instead laying blame for problems like tensions with nuclear-armed countries on Republicans and Democrats, the establishment in Washington and entrenched special interests. The congresswoman said she also wants environmental protections, a reform of the criminal justice system including an end to the federal prohibition on marijuana and to pass a “Medicare for all” health care plan.